Contact AccountEdge for pricing details. AccountEdge Pro Reviews Recently Reviewed! Pros: It is very easy to set up your company. It is very easy to navigate through the program. It has all the features that the big name overpriced software companies have and more. It works great for our air conditioning company with accounting that can be broken down by jobs. The payroll service is very easy to use and they keep it updated all the time. I think I have only called customer support 2 times and both times they had my questions answered right then. I would recommend this software to anyone needing to breakdown your accounting for custom reports, job tracking, employee handling. Cons: The one pet peeve I have is that most of the payroll reports don't have totals you have to export them to excel and reconfigure them to get your totals or total everything by hand. Some of the reports they way they are laid out make it very hard to reconfigure them in excel. It doesn't let you access history more than two years so you have to look up on your back ups if you need to find something older. Overall: it's great for custom reports, breaking down expenses for each job, setting up vendors and customers with custom pricing, discounts, shipping, and tax information as well as detailed contact information. Pros: Flexibility to adapt it to my business needs. Cons: ?? In over 20 years of using the versions of this software any cons I had are gone because the developers listen an input users ideas and suggestions. Overall: I've been using AccountEdge Pro since it came out. before that I was using MYOB. I have tried QuickBooks and Quicken and frankly AccountEdge Pro works like I think. 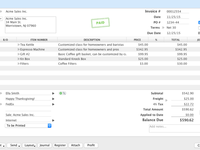 Entering Invoices, and purchases is simple and quick and updates my inventory. All of my bank accounts, credit cards, loans, lines are easily reconciled and auto payments keeps them updated. At the end of the year my accountant gets a copy of my file, reviews it, gives me accountant adjustments to enter, and completes my taxes. If I wanted, I could just print out any report he needs easily and he could complete the taxes with those reports. but since he is a AccountEdge Certified CPA he offers to do a complete review and helps guide me on setting things up correctly. I can run my business instead of having to be or having to hire an accountant for daily, and weekly bookkeeping!! Recommendations to other buyers: Make use of the Accountedge Certified CPAs in your area or nearby state to help set you up for the first time. Their help is invaluable. You can do it on your own but you'd be way ahead and ready to run your business if you make use of them. Pros: I have been using this software for years. It keeps track of all the payroll information the is needed for doing payroll yourself. Very simple to use. Cons: It may be a user error, but I wish I could delete items in inventory easier or change the items name. We are Sharp dealers and sometimes product numbers change and I would like to get our inventory lists shorter to keep the file smaller. Overall: I can do our own payroll. Our accountant is only needed at the end of the year to do our overall business taxes. She is happy with the way that information is presented. In response to your inventory issues, you can delete an item as long as the quantity on hand is zero and can not be pending on any invoices. You would also need to purge old transitions that have this item on it. You should be able to change the Item name/number easily by going into your Item List and clicking on the item, just click on the Name or Item Number field that you would like to change. If you need additional help, you can reach out technical support team for free at accountedge.com/help. Pros: Flexibility, efficiency, ease of use, support, efficiency. Cons: There are so many features that sometimes I get lost in the choices, especially the reporting choices. Overall: AccountEdge Pro and earlier products all the way back to earlier software products have provided a way for me to serve as a volunteer treasurer at my church, homeowners association and civic association over many years. AccountEdge Pro provides all the features needed in an easy to use, fully integrated, efficient package for the accounting needs of the organizations I've helped. Closing each year and moving on to the next is done in a matter of a few minutes. The reports can be customized so everyone can easily understand the financial situation of the organization. Each year the product has improved. I've only needed support a few times over the last 15 or so years, but each time the support was easy to get and those helping were pleasant and knowledgeable, unlike my experience with other product's support when trying to get help with that I use for my personal finances. When I've handed off my duties to others, moving from the Mac environment I use to the Windows environment others use has gone smoothly. I strongly recommend AccountEdge Pro for anyone needing a robust, complete, usable, multi-platform accounting solution made up of superb software, top-notch support, affordable cost, flexible reporting and great human engineering. AccountEdge allows me to do quickly and easily take care of my organization's accounting needs. Recommendations to other buyers: AccountEdge is excellent for small organizations. Just give yourself some screen time to get used to the process and you are good to go! Pros: Fairly customizable to meet our unique needs. Love that payroll and inventory tracking are built in, not some extra service. Also tax forms (which are an additional fee), and credit card processing (but would be nice to use Stripe instead). Just added kits for inventory, which is long overdue. Basically it's one stop shop for us and meets all accounting, inventory, POS needs for phone sales. Cons: That it is not an entirely online software solution so that we could easily (at no extra cost) access and work with data anywhere. That it does not integrate seamlessly with our ecommerce software (only works with Shopify, which is a more expensive and less flexible option than Bigcommerce). The tax form should integrate more seamlessly and be part of the monthly support fee. Overall: Generally good. Been using it for over a decade and it meets the needs of our publishing and consulting business just fine. Cons: Slow performance during some functions. Overall: I love AccountEdge. 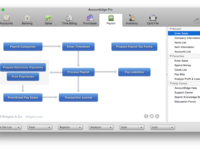 AccountEdge I consider the best small and medium business software on the market. Beyond AccountEdge, I have used and taught other people Peachtree, Sage, Quickbooks, and Simply Accounting. So I have experience with a lot of accounting software. 1 - AccountEdge has AR, AP, GL, Payroll, Time Billing, and Inventory all built in. 11-Accountedge is a lot cheaper. Pros: It makes sense--the reports and searches are logical and easy to figure out. It's easy to find your way around. It can keep you from making stupid mistakes like duplicating a vendor or customer card, but if you do, you can merge the cards. 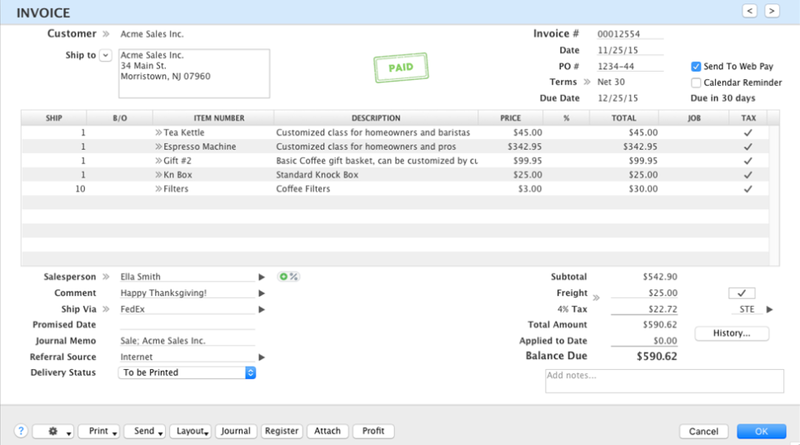 The check and invoice forms are completely customizable. Cons: I didn't like having to open old data files to get information from prior years, but now the program allows you to keep transactions from the last eight years, I believe. I still have to restore old files from time to time, though. Overall: I've used several different accounting programs and am forced to use two others right now at different clients, and AccountEdge wins hands down. I can do so much more, in a logical and intelligent way, than with the other programs: reports, searches, even simple transactions like checks, deposits, journal entries--they all make much more sense in AccountEdge. Pros: They are constantly updating the software and I've only had one data "glitch" in the 13 years I've run the software (with hundreds of thousands of sales invoices/quotes/purchase orders/transactions and that one problem was rectified by their support team very quickly. Cons: I love that they add new features yearly, but typically I don't find the features as useful as I'd find others. They are always willing to take feedback however, and I look forward to some of my suggestions being implemented. Overall: We are a software company with most of our business taking place online. I do regular reconciliation of hundreds of thousands of transactions consolidating them into AccountEdge weekly, bi-weekly, or monthly. In addition we have lots of direct customers that pay by Purchase Order. We drop-ship a number of hardware products from various vendors. Pros: The software is easy to use, it has many built in help options and it is fully customizable, including reports and categories. I can track referral sources by whatever name I choose, and run reports to see where my business is actually coming from and what $$ it is worth. This is great for year end review for advertising and marketing planning. I have used this software since 1994, when it was originally titled MYOB. Cons: I would like to be able to run reports from prior years. I can view information, but it would be nice to be able to run a P&L from 5 years ago and compare it t this year, instead of just last year versus this year. Overall: I started using the software in 1994 when it was MYOB. I love it. It has really helped us keep track of our expenses, income and referral sources, which has allowed us to tweak our advertising and marketing dollars to their full advantage. My CPA loves the reports, ver the years we have tweaked the categories for reporting, and now I give him the P&L report and my bank statements and he is able to do my corporate tax returns with just those. The software is easy to use, easy to set up, and easy to correct if a mistake is made. Cons: No ability to show customer total outstanding balance without a statement. I also think the reconciling process is clunky for bank statements and credit cards. My deposits show twice when I group them for a bank deposit slip and customer balances can be inaccurate on "cards". Overall: Overall AccountEdge makes my business bookkeeping simple-- I've used Quickbooks for other clients and I really do prefer the way AccountEdge handles billing for a daily service industry (we are in landscape maintenance). I wish the mobile technology allowed my husband to see more customer info when he is in the field, but we are able to work around that typically. Cons: The inventory module puts a reversing entry in when you receive material and you have to take it out. Overall: We have used AccountEdge for over 20 years. (When it was originally MYOB). It works with our small business very well for the price we pay. We tried another software that cost 10 times as much and it wasn't user friendly at all and had a lot of issues. Will stay with AccountEdge. Our Inventory tracking in AccountEdge should not be requiring you to manually make any changes because of a reversing entry. I spoke with our technical support team and they would need more details to fully understand what is happening in the software. You can reach out to our support team at accountedge.com/help for free to get this figured out. Comments: AccountEdge is a solid Accounting System, however, the Paid support is lacking. The support Staff are not overly familiar with the product they are supposed to be supporting, and you are put on hold constantly why they "research" your issue. 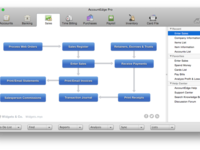 Pros: AccountEdge for Mac is a solid Accounting Program. It allows me to keep track of everything financially related to my company. It also allows me to do my own Payroll, which is helpful. Cons: The product does not support iOS devices very well. It has not updated its AccountEdge for iPhone application to keep up with its competitors. My Personal iBank iPhone application integrates seamlessly to my Desktop program, allowing me to keep track of my finances in real time, on the go. Best Accounting Package Out There! Pros: It is easy to use and meets all of my needs. Overall: I am a former QB for Mac user. After spending countless hours on the phone with customer support (from India), and not being able to under stand the tech or being able to get them to understand my software problem, I decided to look for a better accounting package. I found it with AccountEdge Pro. The software is easy to set up! It works great! And customer support is FANTASTIC! Whenever my company changes or I forget how to do something, I call customer support. If they are busy they will call me back. When I am on with customer support, they are english speaking from New Jersey. Lets just say they are "Made in America". They have always helped me with my problem. I have been with AccountEdge Pro for several years. You can't go wrong with this software company. I love these guys. Pros: Easy to set up, easy to use, easy to understand, just plain easy. Cons: It has too much? lol. I don't use a lot of the features that are available, but if I need something, it is there. Overall: I have had this software since early 90's when it was MYOB (Mind Your Own Business). Loved the name! I had already gotten Quicken and was lost from the start. I didn't even install it to my computer, it was so confusing. MYOB/AccountEdge was so easy to set up. It took me no time at all to be up and running. I waited a year or so to get the payroll module... what a mistake. I should have gotten it at the same time... again... easy , easy , easy. I was spending hours upon hours doing payroll, withholding, employee records...etc... got set up... now it only takes me minutes. Love it! Pros: I manager the office of a small company. We were using QuickBooks. Since their customer support was less than helpful and not based in the States, when we switched our computer system, I switched our accounting software to AccountEdge. The three big keys for me was that AccountEdge had customer service available here in the States that can be reached easily with a phone call, the price is reasonable, and they have a decent program. Cons: Corrections and adjustments are more difficult to make. Pros: Works great for us Mac users and the features improve with every upgrade. Cons: Have to customize forms with every upgrade. Overall: Been using AccountEdge Pro for 12 years and I'm completely satisfied with this product. Very happy to hear that AccountEdge is working well for your business. We do offer an upgrade tool for your Customized Forms so you don't need to recreate them when you get a new version. Pros: AccountEdge Pro is easy to set up, execute and expand. 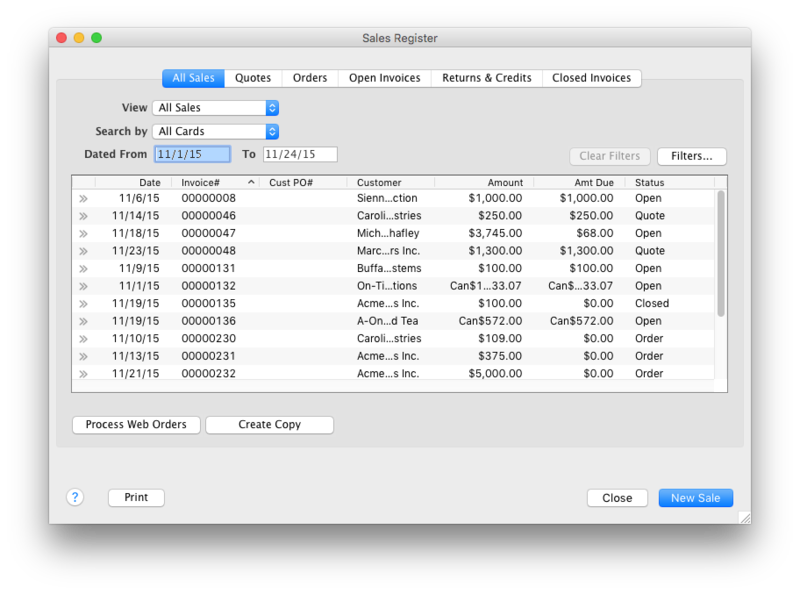 I recently added the payroll feature. By doing this I will be saving money by not having to hire a professional to handle my small business payroll. The modules are easy to understand as is the connectivity between features. There is a lot of support available that is either free or doesn't add a huge expense to my bottom line. Cons: There isn't much I don't like about this software. I've been using AccountEdge for close to 20years and have never thought of replacing it. Overall: I like the ease of use and that certain features are very versatile , like I can create an invoice for either a service or an "item" sale and switch back and forth with ease. The software even recognizes the difference between when I'm paying a utility bill and purchasing inventory and will ask me to switch modules if I need to. Pros: Comprehensive for what we need it for. All cash accounts, including checking; receivables; payables; payroll; and more. Cons: We've used it for so many years that we've gotten very used to it. Because we don't have a learning curve anymore, I don't have complaints. It would be better if it integrated more easily into our database, or Excel. Overall: AccoutEdge Network Edition allows us to use multiple workstations to manage our daily sales, payables, and biweekly payroll. Pros: Installation and use of this software is relatively easy, and requires little to no accounting background to accomplish. You can pick your industry, and the types of services/products you provide, give them some custom names, and the software will setup your chart of accounts, and having you rolling. Setup a few vendors/suppliers, and a few customers, and you can start issuing invoices and paying bills. Cons: The software is not immediately accessible as it does not really follow any similar flow with current modern softwares. The basic system for each function, be it paying bills or selling product, requires either knowledge of exactly which steps you need to do, and in what order, or you follow the "guide" which is merely a large flow sheet of icons, with arrows pointing to various "next steps" in sort of a large circular picture. Overall: We were looking for a small light-weight accounting system to manage some of our ancillary corporations that have very limited activity on them, but need to be audited yearly and reported to in public documents. Thus we wanted something that didn't allow much in the way of mistakes, and was relatively simple to use, without being overly complex and expensive. Cons: I cannot change inventory item information once it has been used and I cannot combine cards if they info doesn't match. I must create new items. Overall: AccountEdge has always been very helpful to resolve any issues I have had. I highly recommend this software. 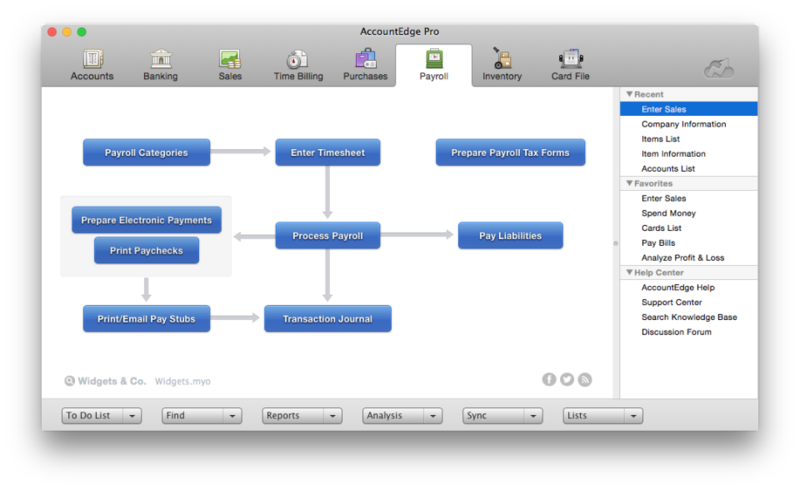 Pros: I've been using Accountedge since it was MYOB. The software is easy to move around and learn even for someone who's never used an accounting program before. Cons: No availability, like a competitor, to have access online especially when it would come to scanning and saving an invoice (online) so it doesn't use up your personal harddrive in the event of a crash as well. Overall: It's been great and will continue to use the software for many years. Comments: Easy to use and good accounting software over all. Pros: It is really easy to use. Most of the new employees have learned how to use it efficiently quickly so far. Cons: Not being able to set 'search by' is the big one. Whenever sales team take orders, they have to type in the description of the products when taking an order or looking it up. Would be great if we could set 'search by item name' and 'contains' instead of 'starts with'. Overall: As a new user, I had the opportunity to use customer support for free for only 30 days. of accounting experience can easily use the software. One of the pluses for our non profit, it that our payroll service is linked with our accounting software and they process out monthly and quarterly returns very inexpensively. Recommendations to other buyers: has some disadvantages vs quickbooks concerning looking back more than a few years. Pros: I like how easy it is to customize in order to fit our specific needs. Overall: AccountEdge Pro is perfect for our small non-profit organization. It is very user friendly. I especially love how fast I can make and customize reports. Processing payroll and making deposits are virtually effortless, which I appreciate. This will be our fourth year with the software and we have never had any issues. Customer service is always prompt and willing to help in any way. We highly recommend this accounting software. Pros: I enjoy the number of features, like the built in payroll option, custom invoices, and the ability to handle retainers. Cons: The software can take some time to learn to use if you are not familiar with accounting rules. Overall: I have been very happy with AccountEdge Pro since moving from another piece of software that could not easily handle retainers. I run a law office and this feature is very important to keep track of clients deposits. 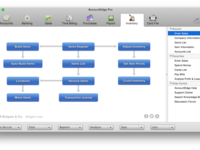 Pros: AccountEdge Pro is so easy to work with. Although there is a small learning curve at the beginning, it is a simple system that allows me to handle all the accounting needs I have. Cons: Hard to find any real issues with AccountEdge to complain about. I do have to give it thought when I change from one banking account to another.. I have to make sure that I'm using the correct checks. Pros: I bought the original software a long time ago because it was Mac based. I am only a Mac user. Cons: I wish the decimal point floated. I know that that sounds silly but it would be nice. Plus, there needs to be a better way to put in "online" payments in check book. I only use checkbook and payroll. All the rest is a waste for me. Pros: The software is easy to teach and use in our business. Cons: We get inventory error messages when we do not expect them. We offer free technical support via email for our customers. Please reach out to our technical support team at accountedge.com/help the next time you receive a random error message. We would be happy to help. A jewel for small/medium size business! Pros: Easy to use and great support if needed. Cons: CRM integration partners are pricey. 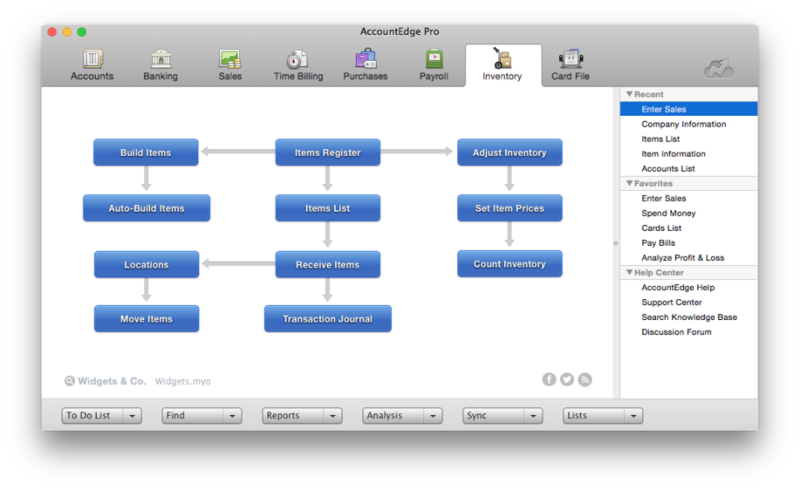 Overall: I started using AccountEdge in 2006 on my Mac. Soon I discovered that it has much better accounting options, it is user friendly, and better use of time with lesser chances of errors. I have not found to date any limitations. Customer service is outstanding. Lastly, my accountant loved the options for payroll that are included. Comments: I love AccountEdge. I've used it for since 1992! Every year they make improvements. 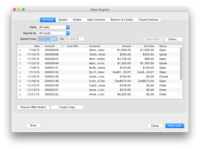 A few years ago they added Bank Reconciliation, importing your activity from your bank. That is the most wonderful thing! Of course, they've done many other things, including this year a direct link with UPS. There is no other software that has done as many things as AccountEdge. That is why I use it and I support other clients using it. Overall: Overall very good accounting software. We've used it from the very beginning when it was MYOB. It's nice to see it keep getting better and better! Pros: It does for us what we want it to do. We are a small non-profit and it fits well with our organization. Cons: That the defaults cannot be changed on some of the most common uses we have. Overall: We have been using this software for our Mac since early in the days it was "Mind Your Own Business." We have been satisfied with the results overall. Pros: generally user-friendly even for those like I who are not accounting-knowledgeable, good, patient, friendly accounting/tech support. although MYOB ownership and name has changed over the years, service quality, continuity and evolution has been smooth and positive. Cons: a little expensive for a single person business and a couple of times there have been two situations where accounting support instructions to solution have not worked - albeit only twice over all these years. Overall: i believe the key word is "control" of the business finances through generally simple, user-friendly management of income, expenses, financial reports and tax preparations for the accounting firm. Pros: Ease of use, low cost, very robust, multiuser, quick response, secure, excellent support and accessibility. Cons: I am having some problems with my save page not showing up full page. Overall: I have been using it for 6 years now and am really pleased with the product and with the support team. Comments: I've been using this software for over 15 years. I previously had used other software and even once left AE (then known as MYOB) to return to previous product based on CPA request. But literally, my brain hurt when I used that product. AE has such a clean and clear interface. It has so many ways to customize the app for MY preferences. The features are logically organized and easy to find, not buried behind a cluttered old-school interface or confusing menus. I rarely have to call in for help, but when I do, it's handled. And all my software upgrades are delivered automatically. The knowledge base is robust, too. I've used that to improve my knowledge of accounting principles. We are a small consulting services company with clients across the USA. Pros: Easy of use and set up. Ability to run needed reports and do taxes in house. Cons: Invoices look a little outdated. Could use some improvements. Overall: Major benefit is keeping track of expenses and tracking income and employee stats. Pros: I like having my program residing on my hard drive rather than having to "rent" the service forever. Cons: I'm not sure that there are really any highly objectionable features. Accountedge does take a while to set up, but I feel that it is really under my supervision at every step of the process. Overall: It is much easier to add accounts "on the fly" as our record keeping needs evolve. Pros: I like this software. It is easy to use. They do not try to rip you off every year or two on making you do the upgrade. As an accountant I am telling all of my clients about this software. Cons: The fact that when or if you need to change a payroll check you have to delete it and reprint or post the paycheck. Pros: I am co-owner of a small Texas business, and am responsible for keeping the books for our business. I was not a business major in school, so was looking for a system that would be relatively simple to use, but robust enough to meet our booking needs. I also wanted something that did not require me to be in the "cloud", and was Mac friendly, and AccountEdge Pro has met all these needs. Cons: There are more bells and whistles than I need, but ultimately I found the functions I wanted and am very happy with AccountEdge Pro. Pros: Easy to use and great for running reports to track our numbers. Cons: The apperance of the software is a little dated. Overall: Great program and we have been using it for over 6 years now. Pros: Again very easy to use for current and new employees, easy to train and adapt, also conversion was quick and pain free. Very effective accounting program. Cons: Lack of searching capabilities is the largest complaint. Searching mod would enhance the programs effectiviness and would make our accounting life easier. Please add. Pros: Very easy to use, just mostly common sense. Cons: Redundant steps. I do not need to asked three times if I really want to do something. Overall: Used it for many years. No problems. Pros: Ease of use and value for the money. Very pleased. Cons: Limited use on multiple machines. Otherwise no concerns. Overall: I have used the product for years - very pleased. 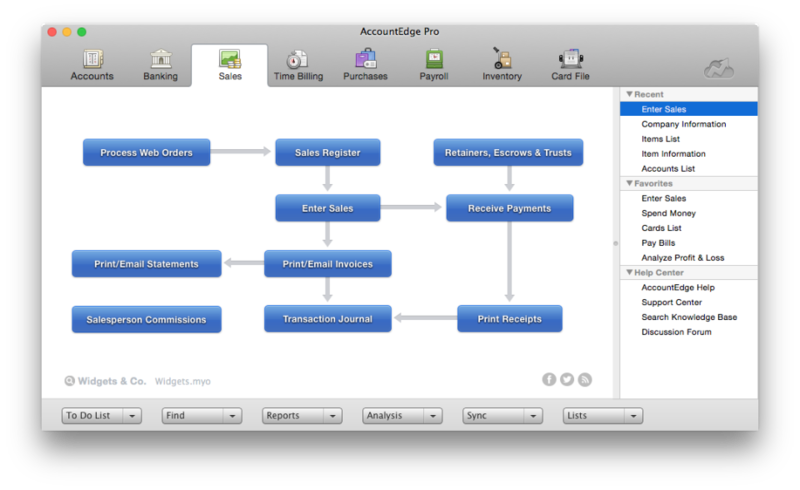 Pros: AccountEdge Pro has everything I need and then some. No matter how big my business grows, I have confidence that AEPro will be able to accommodate me. Cons: The learning curve can be steep. Some vocabulary is slightly different than what I'm used to using, so finding relevant answers in the help center sometimes takes a bit of creativity. Once the correct topic has been found, however, the answers are extremely easy to follow. Overall: AccountEdge Pro has everything you could possibly want in an accounting software and more. There is a bit of a learning curve to it, but the online tutorials and step-by-step help answers have walked me through almost every problem I've encountered thus far. Now that I'm using AccountEdge Pro regularly, I am able to look at my business' numbers and make financial decisions in an instant without having to guess about where we stand financially and what we can expect coming up. Cons: One of the only cons that I find is that it does not integrate with SalesForce. Would make things a lot easier if you could transfer data between the two with out having to do it manually. Cons: That when you upgrade the software it does't save and move your forms over...Its a pain to have to re-create the invoices, etc. We offer an upgrade tool for your Customized Forms so you don't need to recreate them when you upgrade to a new version. Comments: I used it since it was MYOB and it has never let me down. Pros: Ease of use; Drill down capabilities; Multiple reports This program is ideal for a "simple" operation. That is, one location, even if it has multiple services and products. It can handle multiple companies, but if you are a conglomerate with 3+ locations and require consolidated statements, this will not due. It's AR,AP, payroll and billing functions are sufficient and I've never had data corruption issues. Cons: Nothing I have come across, but this is great software for a simple GL. You can have tons of accounts, but if you want departments or cost centres, it becomes a bit more tricky. I will advise you can only keep 3 years of data on it Depending on what you do, you may prefer the ability to drill down 5-10 years in your history..